Nice. 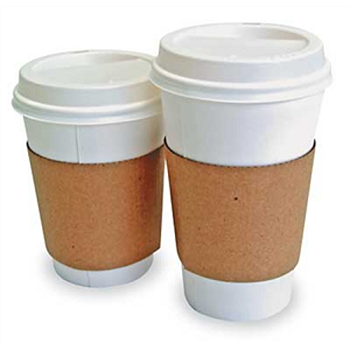 Incidentally, you don't have to take my word for it; the infallible (ha) Urban Dictionary lists this very definition for a zarf. Me, I got this word from a podcast on science and the "enchantment of words" by Halli Casser Jayne, wherein she talks with dictionary editor Steve Kleinedler. For your homework assignment, the next time you go to your favorite coffee emporium and ask for a coffee to go, ask them where they keep the zarfs. 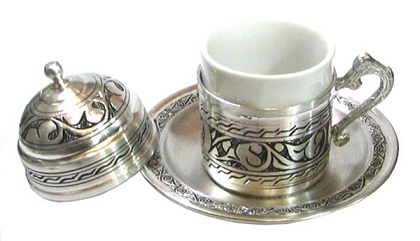 Maybe they'll even have a beautiful engraved silver zarf for you. Moving along to this week's unexpected etymology. The etymological delight this week is the word cynic. In English today, we use this word to mean a person who has a low opinion of people's motives and actions, and especially one who believes people primarily follow their own interests. To quote Oscar Wilde, a cynic is "[a] man who knows the price of everything, and the value of nothing." People might know that we derive this term from an ancient Greek philosophical school—the Cynics—that rejected the trappings of society and preached natural living. But where did that name come from? It seems to have derived from the Greek word kyōn, meaning "dog." (This is cognate with canine, hound, and kennel.) 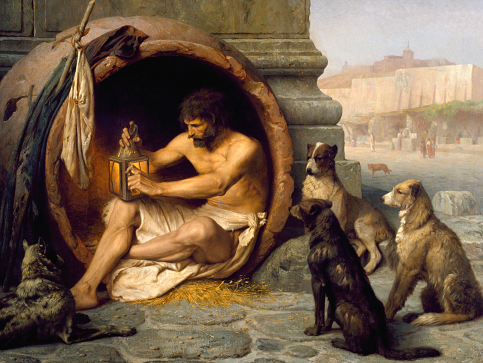 I've heard two stories about why the Cynics might have been referred to as dogs. One is that they were churlish, in (I guess?) a dog-like way. The other is that they lived their lives very openly and (ahem) naturally, much as dogs do.